Wherever you choose to live, you should always make sure you have a garage door repair service available at your area. Nobody wants to get stuck in or out of their garage, you need your garage door to function perfectly. Living in Colleyville, TX, this must sound familiar to you, as most homes include a garage, with a garage door that requires some maintenance from time to time. Veteran is a name you should remember for the times you will have any kind of need regarding your garage door and need garage door repair anywhere in Colleyville. It is a local company that offers its services to towns in the TX area, and they will provide you with all different services and requirements with the utmost professionalism, care and attention. Veteran provides same day service, so the minute you realize there is some kind of a problem, you should contact the company, and they will send a team over as fast as possible. If you require garage door repair in Colleyville, Veteran should be your number one choice. There are service teams spread all over the map, with service vehicles equipped with all the tools, gear and parts that might be needed when fixing your garage door. 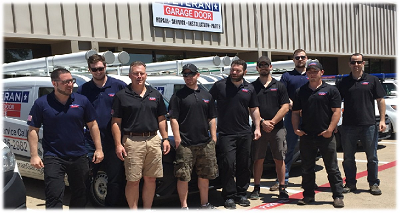 All employees at Veteran are experienced professionals that are committed to leaving you a satisfied customer with the best garage door repair in Colleyville. Veteran will provide you with solutions to all kinds of problems that might occur with your garage door: door off track, bent section repair, opener repair, broken spring replacement, broken roller replacement, sensor repair, loose chain belt repair, broken hinge replacement, noisy garage door, and much more. Veteran provides all parts needed for every fix, and they work fast and efficiently. When you choose to acquire Veteran’s garage door repair solutions in Colleyville, you make the best choice that would benefit your garage door’s function. Aside from garage door repair, Veteran can also provide and install a completely new one for you. Veteran has a few collections of garage doors available to choose from that cater to any taste.